The saga of the 1980 U.S. Olympic hockey team's "Miracle on Ice"--a victory over the U.S.S.R.'s highly skilled veterans during the winter games in Lake Placid, New York--is vividly brought to life in this inspiring true story. Kurt Russell turns in a commanding performance as Herb Brooks, the college coach who used tough, unorthodox methods to get his young players to bond together in order to face off against the mighty Soviets. With Patricia Clarkson, Noah Emmerich, Patrick O'Brien Demsey. 136 min. Standard; Soundtracks: English Dolby Digital 5.1, French; "making of" documentary; audio commentary; featurettes; outtakes. Two-disc set. 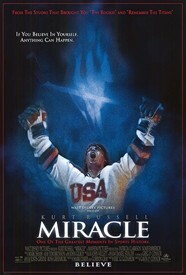 Two-disc set includes "Miracle" and "The Rookie."